The present book is the first complete edition of the 24 Greek and Latin inscriptions in the Collection of Classical Antiquities and the Victoria Museum of Uppsala University. 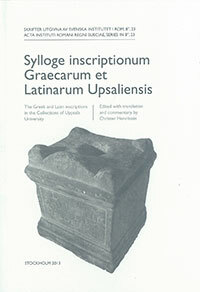 It contains an introduction that discusses the various types of inscriptions represented in the collections, their probable provenance and their history as part of the Uppsala collections. After the introduction follows the actual edition, which consists of a new reading of text of each inscription, followed (where possible) by an English translation, a summary of its physical and palaeographical features, and a line-by-line commentary. The commentary explains each text with regard to its contents and discusses points of linguistic, phraseologic, and onomastic interest. Inscriptions of particular interest are provided with separate introductions that place them in a wider historical and social context. While the commentary is intended to be useful both to specialists in epigraphy as well as to the general classicist, it also aims at providing such information that may interest the general public. The book is concluded by full indices, a concordance of previous editions, and plates of each inscription.